Many women expect they won't feel a touch of labor if they're having a planned C-section, but that is not always the case. 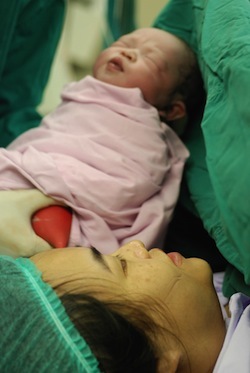 A planned C-section is typically scheduled as close to the due date as possible. There is always the chance that labor will begin before the scheduled date. If there is a medical reason the C-section was scheduled you will be prepared for an emergency C-section, which could take some time. There have been women admitted to the hospital in labor who gave birth before the C-section preparations could be completed. If there is a dire medical need, the C-section will likely be planned well before the due date. Other options include taking medication to prevent labor while the operating suite is prepared for the C-section.